Staff Analysts help the company’s bottom line by eliminating wasteful expenditures and enhancing productivity. The primary responsibilities for these Staff Analyst’s include identifying the business problems by making a thorough research, formulating plans for the identified problem line, selecting and employing analytical techniques to gather and analyze data, presenting recommendations to the top heads on how to solve the business issues and improve business processes and help the management in executing solutions for the proposed reports. These analysts also look into the budget and work on areas that need to be reduced or eliminated. These professionals are expected to show a high level of reasoning skills, and have fluency in operating systems for collecting and analyzing data, as these analysts are involved in budgeting, showing mathematical strength will prove to be an asset. To begin a career as a Staff analyst, the candidates should have at least a Bachelor’s degree in economics, management or business in the Staff Analyst Resume. 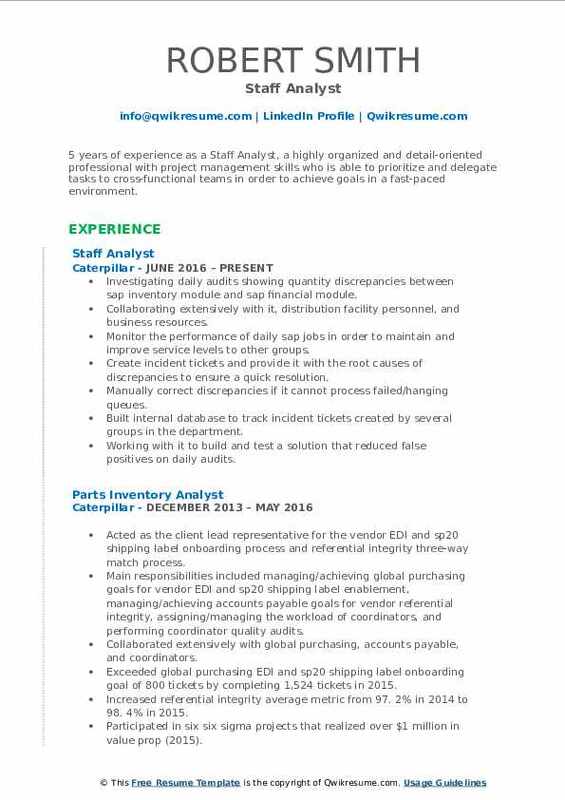 Summary : 7+ years of experience as a Staff Analyst. Hard-working, dynamic professional with over a decade of experience supporting leadership and managing program directives. Strong interpersonal and communication skills encourage positive team interaction and unity. Organized self-starter learns new systems quickly, establishing a reputation as a subject matter expert. Critical thinker has the ability to compile and analyze data. 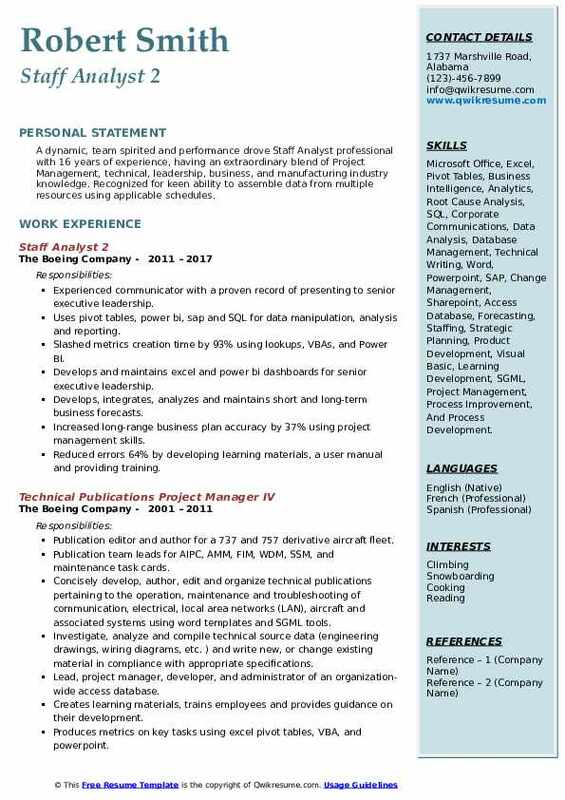 Skills : Project Management, Supervisor, Microsoft Office Suite, including Excel, Powerpoint, Visio, Word, Project, and Access, Milestones Professional, And Cognos Subject Matter Expert. Leading staff analyst for the final assembly manufacturing business unit, supporting the director. Responsible for the design, training, distribution, and understanding of a multitude of program metrics. Some examples include business unit scorecard templates at the director, senior manager, and first line leader level, labor loss analysis, traveler recovery performance, shop milestone delivery, and more. Aligning site and program initiatives with business unit meeting architecture to clearly communicate business goals and opportunities to guide the teams focus on proper priorities. Preparing presentations for upper leadership, utilizing various data sources, charts, and graphics to clearly convey the presentation objectives. Excellent written and verbal communication skills with skillful attention to detail. Guiding and coaching shop staff analysts. Recognized as subject matter expert in multiple software applications, including Microsoft excel, powerpoint, word, milestones professional, and more. Strong ability to interpret management directives to clearly identify and implement desired outcomes, which includes managing actions, owners, and ECDS to ensure follow-through. Extrapolating and analyzing data from multiple software systems; creates charts, graphs, and data tables to tell the story to the leadership team. Facilitating program service award events. Coordinating catering requirements, facilities, award recipient and host communication. Summary : 9+ years of experience as a Staff Analyst is seeking to obtain a full-time position in which I can continue to develop my knowledge of GIS and/or Environmental Issues and the analysis of such issues with a specific emphasis towards environmental analysis. Skills : Program Evaluation, Improvement Data Analysis, Excel, PowerPoint, Visio, SharePoint Development, Administration, Team Center Development, Graphic Design, And Marketing Material Creation. Program management best practices leader for fabrication division at Boeing South Carolina responsible for implementing functional excellence discipline across the program and to drive continuous process improvement. Risk issue and opportunity (Rio) focal and program administrator for fabrication division responsible for supporting in the identification, tracking, creation of mitigation planning, execution and reporting of identified risks. Developer and administrator for multi-department team center site used to centralize information, promote communication, increase cooperation and improve the efficiency of functional groups within the FSC program. 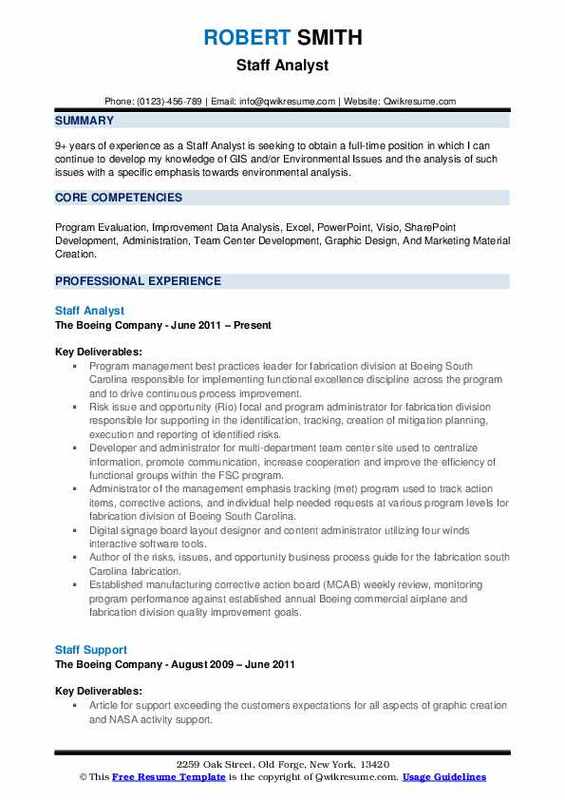 Administrator of the management emphasis tracking (met) program used to track action items, corrective actions, and individual help needed requests at various program levels for fabrication division of Boeing South Carolina. Digital signage board layout designer and content administrator utilizing four winds interactive software tools. Author of the risks, issues, and opportunity business process guide for the fabrication south Carolina fabrication. Established manufacturing corrective action board (MCAB) weekly review, monitoring program performance against established annual Boeing commercial airplane and fabrication division quality improvement goals. Directly involved in daily support efforts to monitor, analyze and implement improvement strategies for internal quality, customer quality, supplier quality as well as compliance with the Boeing quality management system. Collaborate with fabrication core quality metric visibility group located in the north-west concerning data analysis and metrics creation for the web art program of the fabrication flight deck automated metric tool. Researching, analyzing, collected and compiled appropriate data as well as appropriate objective evidence to support a successful production readiness assessment (PRA) audit of fabrication south Carolina operations. Managing final assembly quality budget; analyzed and advised staffing needs as the estimate at completion focal. Developing site-wide metrics responsible for measuring goals established for the performance to plan incentive. Summary : 13+ years of experience as a Staff Analyst. A dedicated team player with experience in multi-phases of aerospace industry (research & development, production, and supportability logistics). Adaptable to a fast-paced challenging environment, providing customers with quality products and achieving high customer satisfaction. 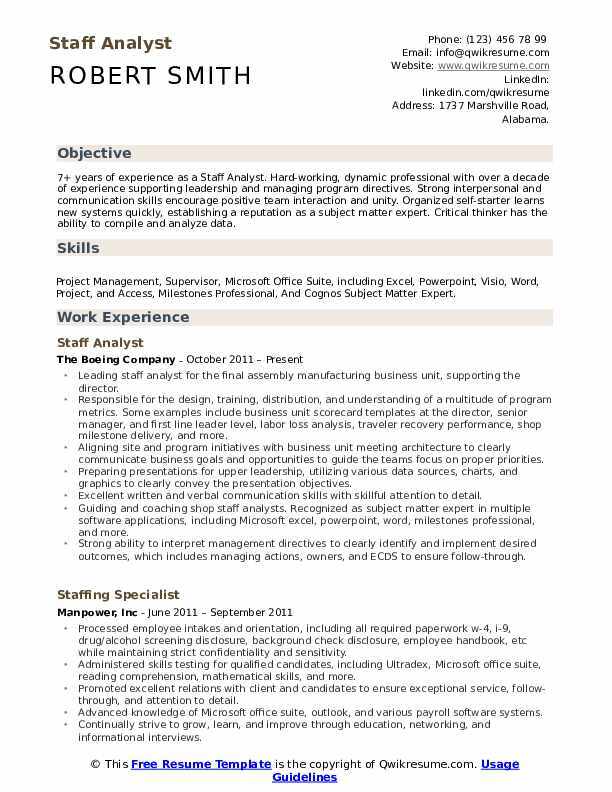 Skills : Microsoft Word, Microsoft Excel, LMIS, Chemical Equipment Knowledge, Problem Solving, And Analytical Laboratory. Supporting worldwide chinook international programs business with proposals and program execution activity in a multi-site team environment. Proposal manager for Italy support campaign at management request. Supporting capture team leaders, program manager, ILS and financial leads by communicating with the team/leadership using verbal and written communications, share point/servers tools for recording emerging requirements and preparing proposal volumes. Team achieved contract award. Leading the design, logistics, and facilitation of various sized meetings and events for the program and executive leadership activities. Successfully coordinating over 100 large customer site visits three years for Canada customer, as well as supporting other new business and program management activities. Responsible for preparing meeting agenda, developed presentation templates for use by integrated product teams, finalized presentation materials with the program manager, develop meeting minutes, send out all presented materials along with minutes to the customer, and action item tracking to closure. Exceptional customer interaction with international customers as well as program management executives for timeliness, recordkeeping practices used in meetings, and overall meeting logistic needs (room size, meeting equipment work, and food choices for week-long efforts). Independently researching and collecting and assembling data from multiple sources for use in the development of analytical models, customer and executive reports/reviews for multiple chinook integrated product team programs as well as rotorcraft integrated technical publications teams. Serving as the liaison for a program manager to executive leadership as required. Presented, discussed weekly updates on the programs accomplishments, opportunities, risks, finances and schedule progress. Working in close coordination with the program manager and team to ensure the developed materials were accurate. Creating cost reduction initiative that leaned out programs process of data reporting preparation efforts by using a computerized macro tool that I developed. Tool improved process accuracy and efficiency for the programs 371 presentations per year. Management provided approval for a 5-year cost reduction initiative project for the macro tool, the program saved $2. 5m. Assisting with the implementation of plans and objectives for worldwide chinook programs long-range strategies, organizational goals, objectives, and initiatives - track plan performance. Developing, assembling, and tracking project metrics used for executive/customer briefs/white papers/presentations, providing necessary trend visibility, and if necessary root cause analysis for off planned activities along with recovery plans. Creating training plans used to support of new to Boeing analysts. Plans brought personnel up to speed in a short timeframe so that the business unit could achieve higher productivity from their new personnel. Served aa s resource/mentor as they required after training. Sought after by other personnel in the business unit as a job expert in software tools such as Boris, met, and MS Office. Supporting program management best practices initiatives with yearly assessment audits, developed and monitored improvement plans that drove organizational improvements. Closed out 100% of findings as planned. 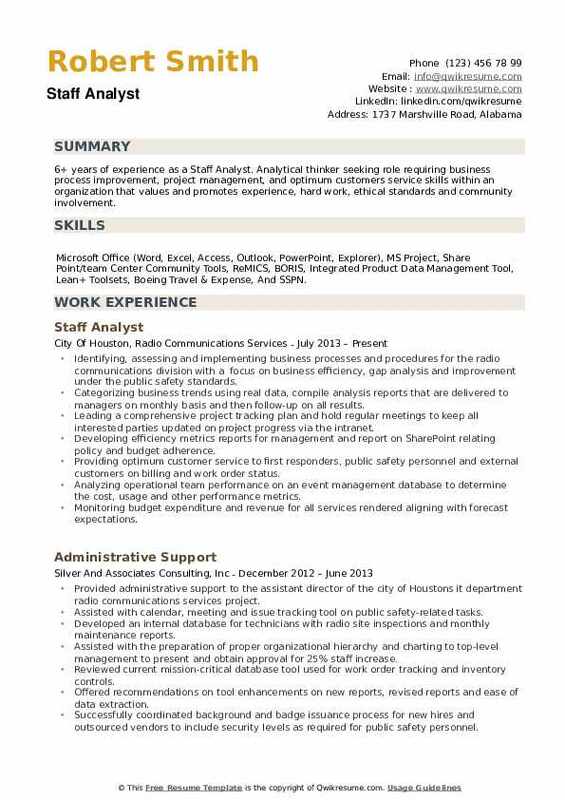 Headline : 5 years of experience as a Staff Analyst, a highly organized and detail-oriented professional with project management skills who is able to prioritize and delegate tasks to cross-functional teams in order to achieve goals in a fast-paced environment. Investigating daily audits showing quantity discrepancies between sap inventory module and sap financial module. Collaborating extensively with it, distribution facility personnel, and business resources. Monitor the performance of daily sap jobs in order to maintain and improve service levels to other groups. Create incident tickets and provide it with the root causes of discrepancies to ensure a quick resolution. Manually correct discrepancies if it cannot process failed/hanging queues. Built internal database to track incident tickets created by several groups in the department. Working with it to build and test a solution that reduced false positives on daily audits. Working with it to improve the runtime of sap jobs and ensure they are completed on time. Acting as the client lead representative for the vendor electronic data interchange (EDI) and sp20 shipping label onboarding process and referential integrity three-way match process. Collaborating extensively with global purchasing, accounts payable, and coordinators. Exceeding global purchasing EDI and sp20 shipping label onboarding goal of 800 tickets by completing 1,207 tickets in 2016. Increasing the referential integrity average metric from 98. 4% in 2015 to 98. 7%% in 2016. Summary : A dynamic, team spirited and performance drove Staff Analyst professional with 16 years of experience, having an extraordinary blend of Project Management, technical, leadership, business, and manufacturing industry knowledge. Recognized for keen ability to assemble data from multiple resources using applicable schedules. Skills : Microsoft Office, Excel, Pivot Tables, Business Intelligence, Analytics, Root Cause Analysis, SQL, Corporate Communications, Data Analysis, Database Management, Technical Writing, Word, Powerpoint, SAP, Change Management, Sharepoint, Access Database, Forecasting, Staffing, Strategic Planning, Product Development, Visual Basic, Learning Development, SGML, Project Management, Process Improvement, And Process Development. Experienced communicator with a proven record of presenting to senior executive leadership. Uses pivot tables, power bi, sap and SQL for data manipulation, analysis and reporting. Slashed metrics creation time by 93% using lookups, VBAs, and Power BI. Develops and maintains excel and power bi dashboards for senior executive leadership. Develops, integrates, analyzes and maintains short and long-term business forecasts. Increased long-range business plan accuracy by 37% using project management skills. Reduced errors 64% by developing learning materials, a user manual and providing training. Analyzes risks and opportunities then create assessments and contingency plans. Applies expertise in data analysis to identify opportunities, provide strategies and deliver solutions that are directly linked to organizational and business goals. Develops a communications plan, learning materials and strategy to meet unique requirements. 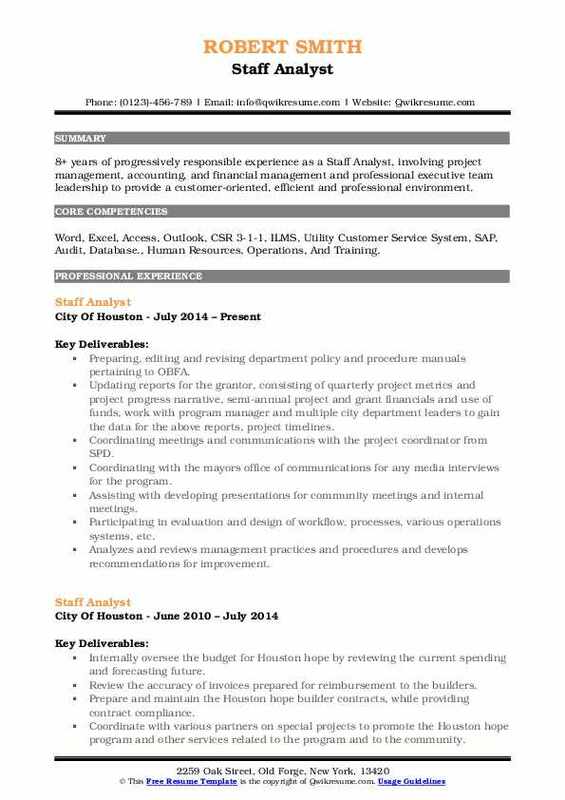 Summary : Experienced Staff Analyst professional with over 11 years of experience in the development, implementation, and management of affordable housing programs and projects.Proficient in Microsoft Excel and Word, Salesforce, Integrated Disbursement Information System, Automated Underwriting System. 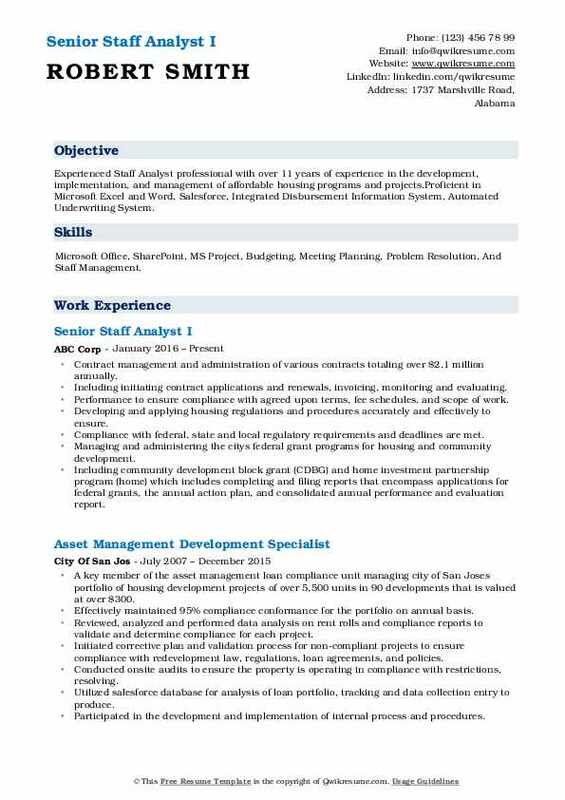 Skills : Microsoft Office, SharePoint, MS Project, Budgeting, Meeting Planning, Problem Resolution, And Staff Management. Contract management and administration of various contracts totaling over $2.1 million annually. Including initiating contract applications and renewals, invoicing, monitoring and evaluating. Performance to ensure compliance with agreed upon terms, fee schedules, and scope of work. Developing and applying housing regulations and procedures accurately and effectively to ensure. Compliance with federal, state and local regulatory requirements and deadlines are met. Managing and administering the city's federal grant programs for housing and community development. Including community development block grant (CDBG) and home investment partnership program (home) which includes completing and filing reports that encompass applications for federal grants, the annual action plan, and consolidated annual performance and evaluation report. Monitoring and conducting an audit to evaluate the performance of housing covenants and agreements and regulatory compliance for 44 rental developments including asset management functions such as. Acting as a budget analyst for divisions capital and operating budget of $108 million for four separate. Funds which includes budget development and execution, and projection and monitoring of revenues and expenditures. Liaisoning for housing developers, non-profit service providers and the public in need of housing and community services. Summary : 13 years of experience as a Staff Analyst. Strong problem solver with demonstrated ability to adapt to change and balance the needs of the team while maintaining confidentiality and providing excellent customer service. Skills : Proficiency In Microsoft Word, Excel, PowerPoint, Project, Outlook, WebEx, DreamWeaver And Staff Planning Tools. Perform a variety of executive and senior leadership support for multiple organizations including materials management and core team. Represent team as a prime contact on projects. Interacts with cross-functional teams on significant matters requiring coordination between organizations focusing on replication of best practices, cost savings, standardization of common processes, tools, and metrics across materials management, supplier management, and manufacturing teams. Support director and senior leaders with presentations and meetings, by coordinating with relevant key stakeholders as required in order to prep leader for meetings and reviews. Compile data from multiple sources to create high-level presentations, analyze trends, produce forecasts and scorecards, and respond to audit findings. (get to green performance to plans on shortages, internal external supplier, performance to plan, 4 squares, scorecard projects initiatives). Develop supporting documentation and track labor/non-labor budget expenditures in the million-dollar range. Maintain parameters to monitor performance and track trends across teams. Gather data for long-range business planning (LRBP) to respond to program study information commitment request (sSICRS) in support of planning and program directives. Communicate activities with program locals to gather and roll up responses to meet program deadlines. Conduct research to document risks and opportunities for the business; analyze staffing needs and facility requirements in support of financial program planning. Provide design, logistics, and facilitation of large meetings/events. (e.g., supply chain council, all hands meetings, employee-related activities, anniversaries, team morale events, community service projects). Lead and manage special projects, events, and facility requirements. Develop and maintain the project schedule and budget. Monitor and track execution of the plan and communicate status to project team. Create process and procedure documentation for standardized business practices. Overtime planning: communicate cross-functionally to build data and metrics for visibility of program weekend plans to provide optimal support while ensuring Sunday coverage is only scheduled with a strong business case. Communicate all informational/technical materials, organizational announcements, and briefings with teams. Plan and prepare meeting agendas to ensure visibility of appropriate information and maintain meeting cadence. (e.g., leadership staff meeting, overtime meeting, safety meeting, initiative reviews, staffing plans, employee survey analysis, and action planning). 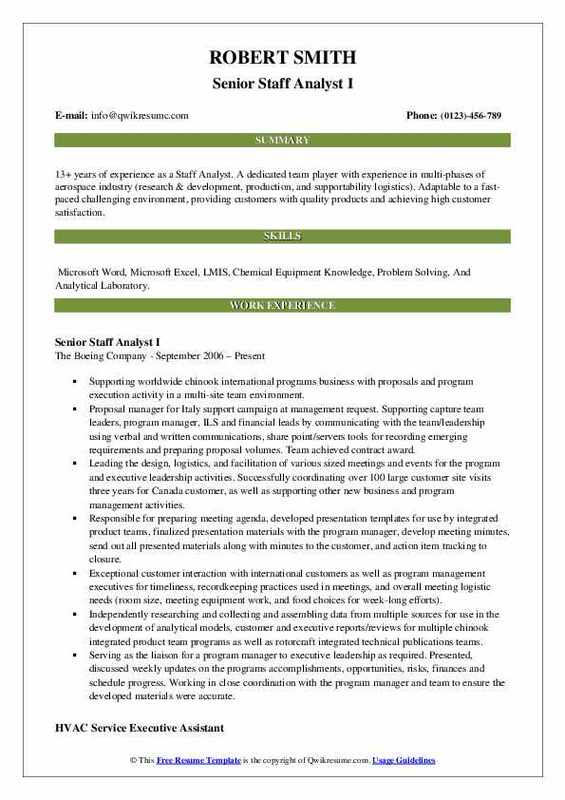 Summary : 8+ years of progressively responsible experience as a Staff Analyst, involving project management, accounting, and financial management and professional executive team leadership to provide a customer-oriented, efficient and professional environment. Skills : Word, Excel, Access, Outlook, CSR 3-1-1, ILMS, Utility Customer Service System, SAP, Audit, Database., Human Resources, Operations, And Training. Preparing, editing and revising department policy and procedure manuals pertaining to OBFA. Updating reports for the grantor, consisting of quarterly project metrics and project progress narrative, semi-annual project and grant financials and use of funds, work with program manager and multiple city department leaders to gain the data for the above reports, project timelines. Coordinating meetings and communications with the project coordinator from SPD. Coordinating with the mayor's office of communications for any media interviews for the program. Assisting with developing presentations for community meetings and internal meetings. Participating in evaluation and design of workflow, processes, various operations systems, etc. Analyzes and reviews management practices and procedures and develops recommendations for improvement. Interprets administrative policies and oversees communication with department personnel regarding these. Compiles data produces information and interprets results through conclusion. Completes special projects as assigned, working on a wide variety of financial, administrative. Professional, management and community issues and problems of simple to medium complexity. 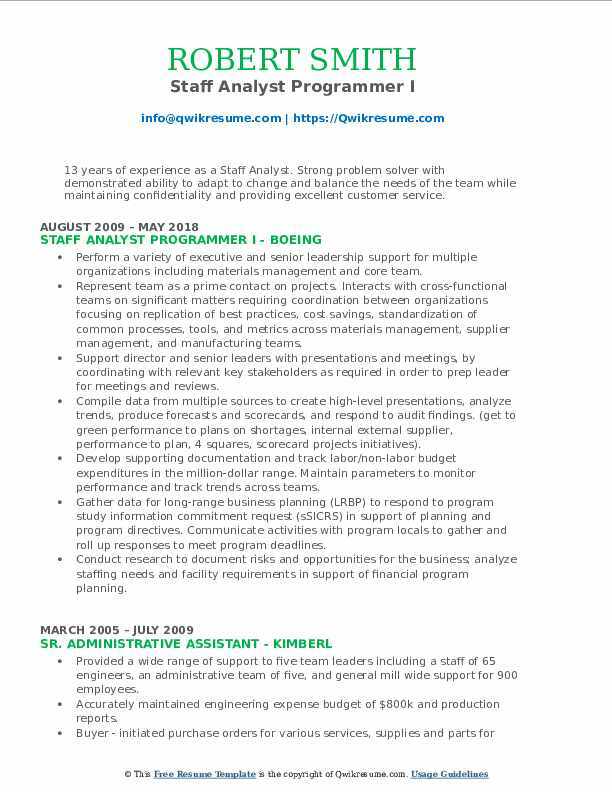 Objective : 4+ years of experience as a Senior Staff Analyst with expertise in performance management, succession planning, and process improvement. A strategic planner with strong communication skills and attention to detail. 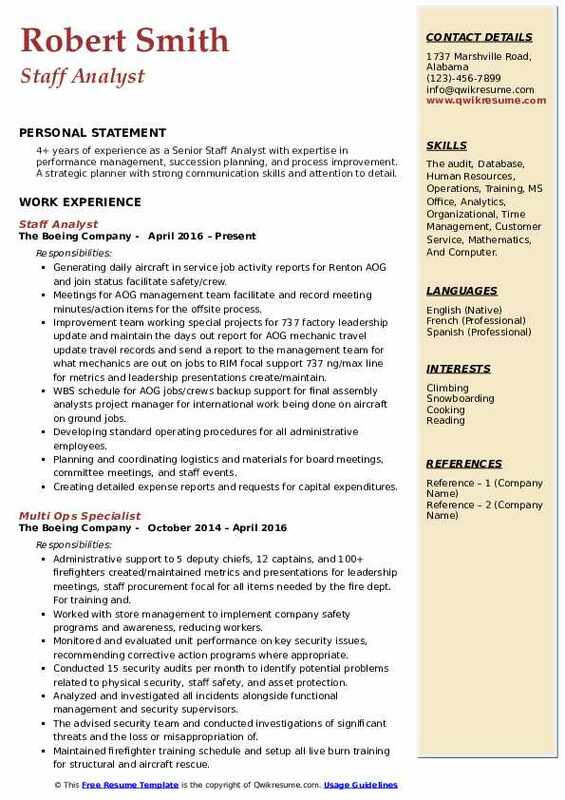 Skills : The audit, Database, Human Resources, Operations, Training, MS Office, Analytics, Organizational, Time Management, Customer Service, Mathematics, And Computer. Generating daily aircraft in service job activity reports for Renton AOG and join status facilitate safety/crew. Meetings for AOG management team facilitate and record meeting minutes/action items for the offsite process. Improvement team working special projects for 737 factory leadership update and maintain the days out report for AOG mechanic travel update travel records and send a report to the management team for what mechanics are out on jobs to RIM focal support 737 ng/max line for metrics and leadership presentations create/maintain. WBS schedule for AOG jobs/crews backup support for final assembly analysts project manager for international work being done on aircraft on ground jobs. Developing standard operating procedures for all administrative employees. Planning and coordinating logistics and materials for board meetings, committee meetings, and staff events. Creating detailed expense reports and requests for capital expenditures. Ordering and distribute office supplies while adhering to a fixed office budget. Coordinating domestic and international travel arrangements, including booking airfare, hotel, and transportation. Working with stakeholders to drive product and service definition and design. Developing numerous executive presentations and reports to facilitate project evaluation and process. Headline : 6+ years of experience as a Staff Analyst. Analytical thinker seeking role requiring business process improvement, project management, and optimum customers service skills within an organization that values and promotes experience, hard work, ethical standards and community involvement. Skills : Microsoft Office (Word, Excel, Access, Outlook, PowerPoint, Explorer), MS Project, Share Point/team Center Community Tools, ReMICS, BORIS, Integrated Product Data Management Tool, Lean+ Toolsets, Boeing Travel & Expense, And SSPN. Identifying, assessing and implementing business processes and procedures for the radio communications division with a focus on business efficiency, gap analysis and improvement under the public safety standards. Categorizing business trends using real data, compile analysis reports that are delivered to managers on monthly basis and then follow-up on all results. Leading a comprehensive project tracking plan and hold regular meetings to keep all interested parties updated on project progress via the intranet. Developing efficiency metrics reports for management and report on SharePoint relating policy and budget adherence. Providing optimum customer service to first responders, public safety personnel and external customers on billing and work order status. Analyzing operational team performance on an event management database to determine the cost, usage and other performance metrics. Monitoring budget expenditure and revenue for all services rendered aligning with forecast expectations. Reviewing trends among business operations within the divisions' sections to help evaluate, update and revamp standard operating procedures for an organization as a unit. Producing complex data reports for management presentations and summarize results in concise formats for executive or city council considerations and approvals. Producing budget revenue reports on a quarterly basis that include forecast exceeding $1m. Designing progressive and accountability tools and matrix for all staff which assists supervisors on performance, activity, and parts usage indicators. Leading on culture change coalition initiative focused on the planning and logistics of the events, forums, presentations and data collection.